Please complete your order online before posting your mobile phones. 1.Battery is inside the handset and the handset is switched off. 2.Packed the handset inside a box and the handset cannot move around in the box and that you have placed the box inside a postal bag or envelope. Note: Multiple phones can be sent but please make sure they are wrapped separately in bubble wrap. Special Delivery is available at your nearest Post Office. It will cost a few pounds, but insures your mobile phones against loss up to a value of £500. This is the method BuyMyFone recommends to ensure your mobile phones arrive safely. Kindly stick the Label which you will be receiving once the order is placed. Make sure you include the Correct Order No. inside the parcel. We also offer free collection on all orders with 4 or more items. Only available if you have 10 mobile phones or more. 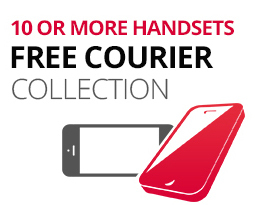 Once you have completed your order please call to arrange a Free courier collection.